Carrie Trotter is a partner at Tilley Deems & Trotter, LLC. She received her J.D. from Georgia State University after graduating from the University of Georgia with a Bachelor of Arts degree. A graduate of Cartersville High School, Carrie returned to her hometown to begin her career and cultivate relationships in the community where she was raised. Carrie's practice focuses on Probate and Estate Planning, Business Organization and general corporate representation. She also assists clients with certain real estate transactions, including foreclosures and real estate closings. 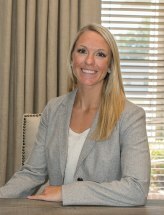 Carrie has been an active participant in the Young Lawyers Division (YLD) of the State Bar of Georgia. Upon graduation from the Class of 2011 Leadership Academy, she served as District Representative for the Northern District of Georgia. Carrie was then asked to sit on the Board of Directors for the YLD in 2012, and later served as Co-Chair of the Solo and Small Practice Firms Committee of the YLD. In her community, Carrie participated in Leadership Bartow, a respected leadership program of the Cartersville-Bartow Chamber of Commerce. She then served on the committee for the Youth Leadership Bartow program in 2015 before being named Chair of the program in 2016 and 2017.